Pevely activist Erin Kasten stated at a November board of alderman meeting that she was told by a former city police officer (and received corroboration from two other sources) that Mayor John Knobloch’s ticket quota for officers, which they reportedly had to meet to keep their jobs, was 20 tickets per month. In January 2013, however, this was increased to 60 tickets per month. In April, it was announced that the city had dedicated one officer solely to traffic duty, rather than making it just an additional duty for all officers (it is safe to say other officers still write tickets). I’m not sure when this started, but we will assume it started at about the same time it was announced. Finally, in June and July, the city took advantage of a MODOT construction zone on I-55 at Highway Z. The speed limit dropped to 50 in this zone, and it was reported that Pevely cops went to town, issuing tickets left and right in this zone. 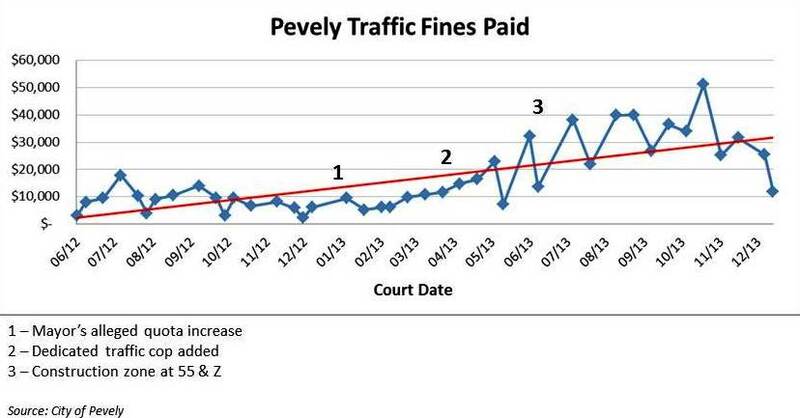 This graph shows Pevely ticket revenue over the past 18 months (including court costs and all that) with the above events annotated and with a trend line. Factor in a month or so delay between when tickets are issued and when they are paid. Which of these factors played the biggest role? It seems like it wasn’t until April that things really started ramping up. It also looks like the construction zone didn’t cause a temporary blip – revenue stayed high until the last court date of the year on December 18. The highest-grossing court date of the year was on October 23, when receipts broke the $50,000 mark. It would be interesting to know how religiously officers meet their ticket quotas. And what can we expect from Pevely police in 2014? The mayor of a muny cannot order a police officer to do anything without the buy in of the Chief. Of course, the Chief’s job may be in jeopardy if he doesn’t go along with the mayor’s ‘vision’. It would interesting to see what the Chief says about the increase. Quotas of so many tickets per month are not ‘enforceable’ however ‘job performance standards’ are. This is a little more complicated but essentially mandates an officer to write so many tickets to obtain a ‘satisfactory rating’- not a set number a month. There seem to be a few things going on in Pevely that legally cannot be done.